When the story about two of the old Bloomingdale avenue houses, that were demolished some years ago, was first written for this column several weeks ago, the story was to have been accompanied by a picture of these houses. They were the former Benjamin F. James home on the southeast corner of Bloomingdale and Lancaster avenues, and the Fox home, immediately adjacent to it on the south. As it turned out, the houses were too much obscured by the heavy foliage of large trees to reproduce well. And so it is with regret that we must omit the picture lent to us by Mrs. Henry G. Fischer. Mr. James tells us that he bought his Bloomingdale avenue house shortly after he came to Wayne to live in 1910, with the sale made through the real estate office of Wendell and Treat. Although it had then been unoccupied for some years, he recalls it as the former home of the Fallon family. Mr. Fox had bought the adjoining property some years prior to the James purchase. Mrs. Fischer tells us that when the Bloomingdale avenue houses were built, those of identical architecture were placed opposite each other along the east and the west sides of the street. According to that plan, the James house must have looked similar to the Ramsey house, later the Charles T. Mather home. An excellent picture of this old house was shown in this column in the issue of July 1. It was recently demolished to make room for the Bell Telephone Company’s dial exchange building, now being erected on the southwest corner of Bloomingdale and Lancaster avenues. 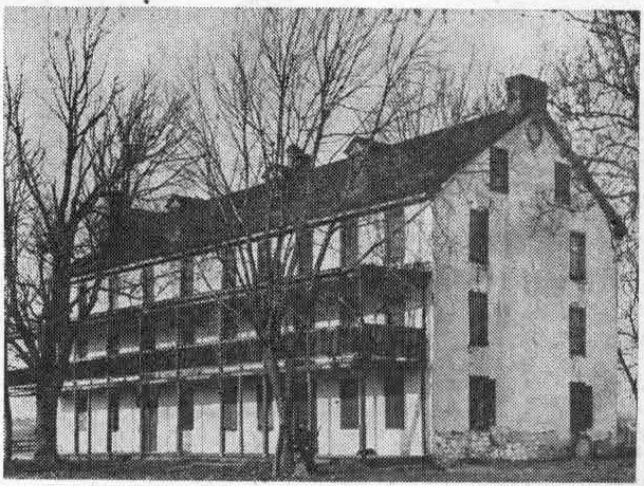 By the same token the Fox house was the twin to the Fischer house, a picture of which was shown in the June 17 issue of this column. The results of the remodeling that Mr. James did, soon after his purchase of the house, are at least indicated in the picture lent us by Mrs. Fischer. For one thing, the front porch which went the entire width of the old house was replaced by a small portico entrance to the front door, thus giving more sunlight into the downstairs. Mr. James describes the stable at the rear as “quite a place,” with its second floor made into wood panelled quarters for the coachman’s family. These quarters were used as recreation rooms for families who later owned the house, and for their guests. As Mr. James recalls the date, it was in about 1930 that these properties were sold to the corporation that erected the Kingsway apartment house. There was some controversy in regard to the location of the building itself, the decision being that it must be set back as far as the Fox property on which, as a matter of fact, it stands entirely. Mr. James describes his former lot as “a pie shaped piece of ground,” with frontage on both Lancaster and Bloomingdale avenues. As the writer walked across that “pie shaped piece” recently she recalled Mr. James’ description of the many difficulties encountered in tearing down this well built structure with its hair-plaster walls. Evidently the new owners lost heart when they reached the foundation walls. For no demolition at all of any of these was done, the cellar rooms being merely filled in with dirt. Now, 25 years later, that dirt has settled to the extent that the tops of the cellar walls are slightly above ground, making the room plan of the old house again visible. “For your section ‘Your Town and My Town,’ perhaps the photograph which I am sending herewith may be of some interest. This house was the residence of my parents, Mr. and Mrs. John M. Gallagher, of Lancaster and Conestoga roads, Wayne. The picture was taken about 1905. The corner was sold two years ago to the Gulf Refining Company for a gas station. For many years the Gallagher family has been well known throughout this entire section. The Bateman-Gallagher Post is named in part for a son, Edward Gallagher, who lost his life ln World War I. Mr. Gallagher was a prominent business man, being at one time the president of the Radnor Building & Loan Association. Mrs. Gallagher was not only the organizer and first president of the national Gold Star Mothers, but she was also instrumental in starting the Pennsylvania Chapter of War Mothers. 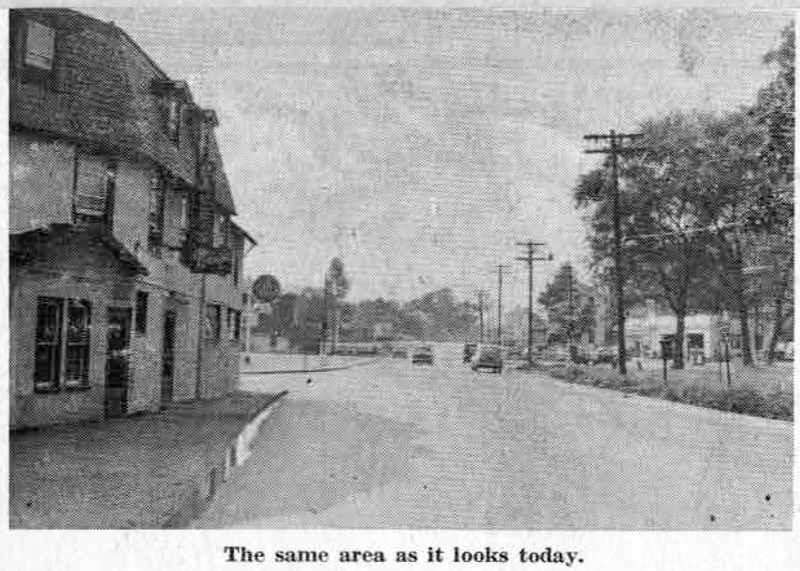 When the Gallagher house was built, the famous old Spread Eagle Inn, which had stood almost across the Pike, had just been destroyed, or perhaps was just about to be destroyed. As reported in last week’s column, the inn’s last owner, George W. Childs, used the stone in it for the Bloomingdale avenue houses, possibly even some of it for the very house that was about to be constructed at the intersection of Conestoga road and the Pike. Built in 1796, the handsome four story stone building pictured above, with porches extending along the entire front, replaced a crude little structure of the same name which had been among the first of many inns to be built along the old turnpike. Sixty-seven taverns lined the 62 miles of this turnpike before the Philadelphia and Columbia railroad was completed by the Canal Commission in 1820. With the coming of the railroad the stage coach travel along Lancaster Pike decreased until there was need for only the more spacious and better equipped inns. Some, however, and particularly those close to Philadelphia, remained open as summer boarding houses, as did the Spread Eagle for a number of years. It was then that it was torn down by order of Mr. Childs. The second picture, taken only last week, in contrast to the one taken 50 years ago, shows more plainly than many columns can describe, the changes the years have made along Lancaster pike, at the junction of Wayne and its neighboring suburb of Strafford. It is only recently that the John M. Gallagher house, on the left in the first picture, has been demolished to make room for the new Gulf gasoline station shown in the second. Old timers among us may look with a certain wistful nostalgia at the quiet peace of the scene in the first picture, with its one vehicle approaching the intersection, and that one a horse drawn wagon! Great trees line the highway and shade the large Victorian style dwelling with its mansard roof and, shuttered windows. Built by Drexel and Childs in the 1880’s, this dwelling is of the same style of architecture as those lining Bloomingdale avenue, between Lancaster pike and West Wayne avenue in the late 1880’s and 1890’s. The famous old Spread Eagle Inn, built in 1796 to replace a still earlier small crude structure, stood across the road from the Gallagher house and slightly to the west of it. By the time this picture was taken, it had been demolished, however, by George W. Childs, who needed the building stones for his Bloomingdale avenue houses. Besides, he feared – or so it was said – that liquor might again be sold there as in days gone by! Directly across the road there already stood the building that is now known as the Spread Eagle Apartment, with shops on the first floor. Sheltered from view by the trees to the right in the first picture, the large house, with its stables and other outbuildings, was a private home of mansion-like proportions. Mrs. Charles Suffren, one of Strafford’s old time residents, recalls that the beautiful home had several owners, among them an early member of the George B. Thayer family. The George Wharton Pepper family also lived there at one time. The second Spread Eagle Inn was still standing when the mansion house just described was built. Just to the west of the Inn was a small and very old stone house, recently remodelled by the Wayne Title and Trust Company as its branch office. 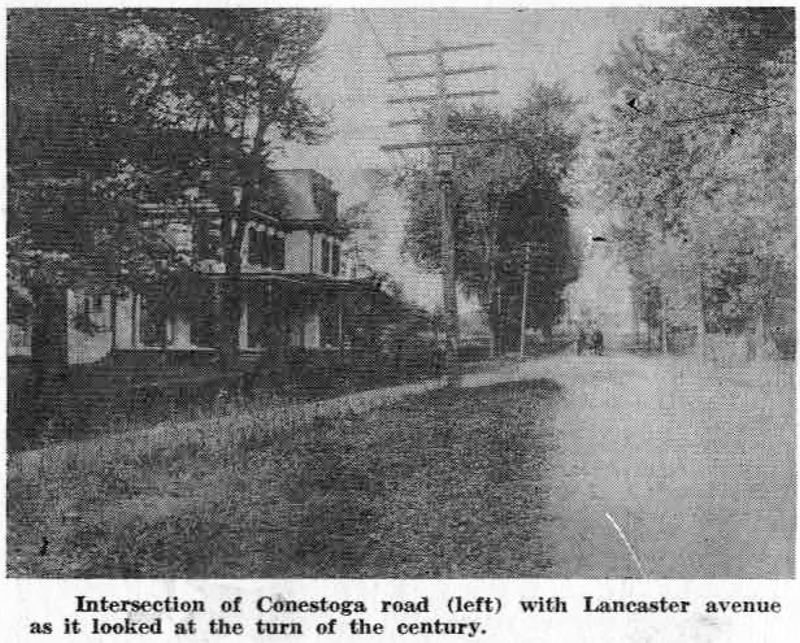 Mrs. Suffren tells us that this was one of the most famous toll houses along the old Lancaster pike. One of its first rooms almost touched on the road, making a vantage point from which tolls of three cents per vehicle were collected by the woman in charge as she lifted the long bar that extended across the road – a procedure rather difficult to imagine in this era of fast moving traffic. So much for what was once sheltered by the tall trees on the right hand side of the road in the first picture. The second picture is so new as to be self explanatory, even to the highway marker which sets a speed limit of 35 miles per hour at this point. Dave’s Bar, as its large sign shows, occupies the once vacant triangle bounded on one side by the pike and on the other by Conestoga road. Beyond that is the new Gulf station while across the pike is a Cities Service gas station, built a short time ago. In the picture it completely hides the smaller of the Spread Eagle buildings – a low and attractive structure which was once the stables for the mansion house. Now a part of the apartment house, it is not too many years ago that this building was a picturesque tea room. The several storied white building just beyond the Cities Service as station is the Spread Eagle Apartment house, with its first floor display windows and shops. And beyond that is the old toll house, remodelled to meet the needs of the Branch Office or the Wayne Title and Trust Company.